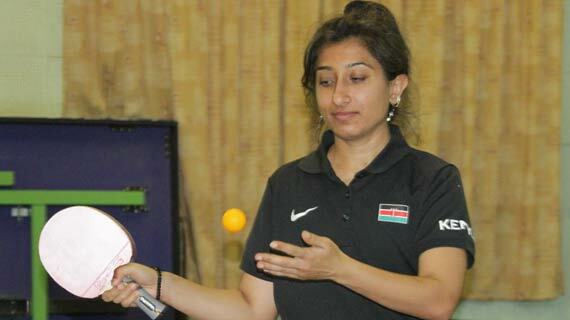 Kenya’s longstanding women’s national team player Sejal Thakkar bowed out of the 2016 ITTF-African Olympic Qualification Tournament in Khartoum on Wednesday. Thakkar who was Kenya’s sole surviving player after qualifying in the quarter finals was eliminated 4-0 by Lynda Loghraibi of Algeria. The Algerian savoured a place in the last four, but not without a struggle. Loghraibi was compelled to fight it extra hard to vanquish the spirited Kenyan who had finished second in the preliminaries. “Her anti-spin bat distracted my game quite a bit. She also looped with lots of spins. But all in all, I’m proud of representing my country and reaching the last eight in the women’s singles,” said Thakkar. Loghraibi who is only a match at away from the Rio Olympic Games qualification made up for compatriot Islem Laid who lost 2-4 to Nigerian Offlong Edem in a breathtaking quarterfinal. Three other Kenyans Anthony Mathenge, Della Njani and Peter Theuri were eliminated at preliminary stage on Tuesday. Sejal returns to the completion for the IOC ranking matches.